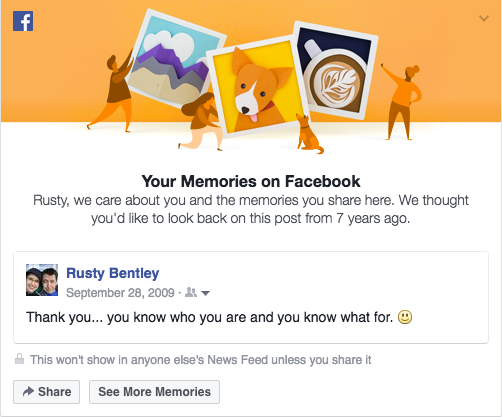 I'm typically not so cryptic in my Facebook posts, but this one has thrown me for a loop. I have no recollection of the context of this post. Those of you that know me understand how uncomfortable this kind of thing is for me. For those that are wondering, I tend to obsess about little ridiculous mysteries that ultimately don't matter at all to anyone but me. With regard to this memory, the main issues are that a) I don't like the thought that there are details of my life that I can't easily recollect, and b) I now want to thank someone for something that happened seven years ago but I don't know whom to thank or what to thank them for. This annoys/bothers/upsets me now, even though I clearly (or more precisely, vaguely) did the thanking seven years ago.